This guide is designed to help you find and choose a funeral director in Brisbane. We understand. It’s a daunting task. At one of the worst times in our lives, we’re required to answer some extremely difficult questions about which funeral director to trust, what type of service to arrange and how much to spend. Gathered Here is a free and independent funeral home comparison website. 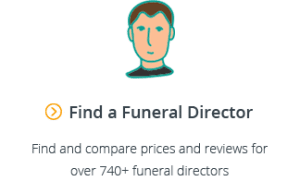 Each month we have over 8,000 visitors searching for funeral services on our website, and we have itemised pricing information and reviews for over 110 funeral directors in the Greater Brisbane, Gold Coast and Sunshine Coast areas. Alternatively, you can go directly to our dedicated search page for Funeral Directors in Brisbane. 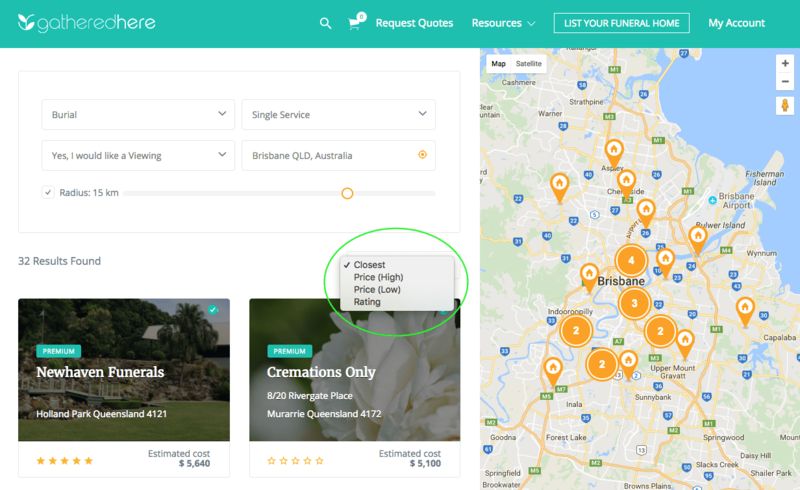 Tip: When viewing the comparison results, you can filter your results by selecting “Price (Low)” to see the cheapest funerals in Brisbane, or “Rating” to see the best rated funeral directors in Brisbane. Two key considerations for families when comparing funeral directors are price and customer reviews. There are significant differences in price and service levels offered by funeral directors in Brisbane so it’s important to do your research and really think about what your main priorities are. The cheapest funerals in Brisbane start at $1,290 for a no service, no attendance cremation. For more information on cost-effective funerals, read our Guide to Cheap Funerals in Australia. Compare this to the most expensive option in Brisbane which is $5,895 just for the professional services fee. When you then add on the average additional costs (such as a coffin, transfer fee, celebrant, funeral flowers, newspaper notices, headstone and cemetery fees) then you’re easily in excess of $19,000 for a burial. 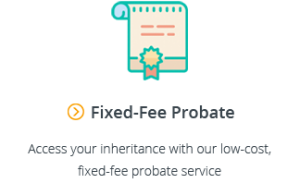 For more information on funeral costs you can see our articles on Understanding Funeral Costs, the Average Cost of a Cremation and the Average Cost of a Burial. While the idea of a cremation without a service may seem too distant for many families, a growing trend in Brisbane is to pair a no service, no attendance cremation with a memorial service held several days after the cremation. This keeps costs down but also gives family and friends a chance to properly pay their last respects. Many people choose a funeral home based on the single recommendation of a family member or a friend. And while word-of-mouth referrals are important, the availability of the internet means that families can now access much more information than was previously available. Funerals are often far and few between and things can change, so it’s definitely a good idea to look at more recent reviews (which you can do on our website) even if you do have a personal recommendation. The more positive reviews you can find, the more confident you can feel about trusting a funeral director with your loved one. You might not know it, but a multinational corporation called InvoCare owns 36% of the funeral homes in South East Queensland. This means that there’s a good chance that most of the funeral brands you’ve heard of are owned by this corporation. There are a number of other large funeral companies in Brisbane including K.M. Smith Funeral Directors and Alex Gow Funerals but none are on the same scale as InvoCare. Choosing between a corporate or family-owned funeral home is a personal question. 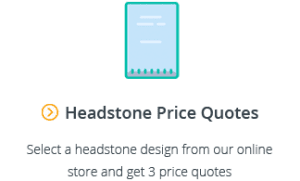 Corporate funeral homes are often able to charge a premium due to brand recognition and the belief that their services will be of a higher professional quality. On the other hand, family-owned funeral homes may be more variable in quality of service, but are often more connected with the communities they serve and have more freedom to tailor funerals to reflect the wishes of the family (rather than being bound by strict package options). By default, our comparison site will show you funeral directors within a 15km radius of your postcode. However, most funeral directors can service a larger area than this, so you might consider casting your net wider and searching suburbs that are further away. Beyond this, some Brisbane funeral directors often travel as far as the Gold Coast and Sunshine Coast for families. The main things to think about when it comes to a funeral director’s location in Brisbane are: (1) proximity to their storage/chapel facilities if you’re planning on having a viewing; and (2) proximity to the final service venue if you’re having a dual service. If you are planning on having a viewing, it’s important to ask the funeral director where they can hold the viewing. Some funeral directors might have an office location that is close to you, but their chapel and/or storage facility might be much further away. South East Queensland is a large region and there are concentrations of mortuary facilities further out from the main metropolitan areas. If you have a large family which plans to visit the deceased only to later find out the viewing can only happen in a different region of Brisbane because that’s where the body is being stored, this can be a source of major frustration. Finally, if you are planning on a dual service that starts at the funeral home chapel and then moves on to the cemetery or crematorium, you should also consider where the funeral home is in relation to your selected final venue. You don’t want friends and family having to drive overly long distances to reach the cemetery or crematorium for the final committal ceremony. You can read more about these cemeteries, including the burial and cremation memorial options they offer, and their on-site facilities, in our Complete Guide to Brisbane Cemeteries. Most of the time the decision is simple as there may be family plots or historical attachments to certain venues, but if you don’t have a set venue, it’s definitely worthwhile visiting a few locations to see the grounds and facilities. For further guidance, see our guide to Finding a Cemetery in Australia and our guide to Brisbane Crematoriums and Cremation Services. That’s it. We hope you’ve found this guide on finding and choosing a funeral director in Brisbane helpful. 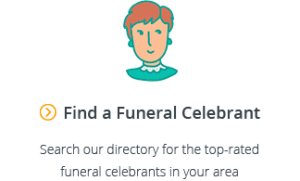 If you’ve found a funeral director and would now like help finding a funeral celebrant, see our Brisbane Funeral Celebrants Guide or go directly to our dedicated search page for Funeral Celebrants in Brisbane. And if you have any questions for us, feel free to email us at support@gatheredhere.com.au or leave us a comment below.